Inelastic or quasielastic neutron scattering experiments using cold or thermal neutrons with good to medium energy resolution. CNCS is a high-resolution, direct-geometry, multi-chopper inelastic spectrometer designed to provide flexibility in the choice of energy resolution and to perform best at low incident energies (2 to 50 meV). Although the detector coverage around the sample is 1.7 sr, a later upgrade to 3 sr is possible. Experiments at CNCS typically use energy resolutions between 10 and 500 µeV. A broad variety of scientific problems, ranging from complex and quantum fluids to magnetism and chemical spectroscopy, are being addressed through experiments at CNCS. Funding and development of this instrument was overseen by a university-national laboratory collaboration. CNCS beam intensity in a neutron monitor for a few popular choices of the instrument setup. The sample is an annular vanadium foil: diameter of 10 mm, height of 63 mm, thickness of 1 mm. 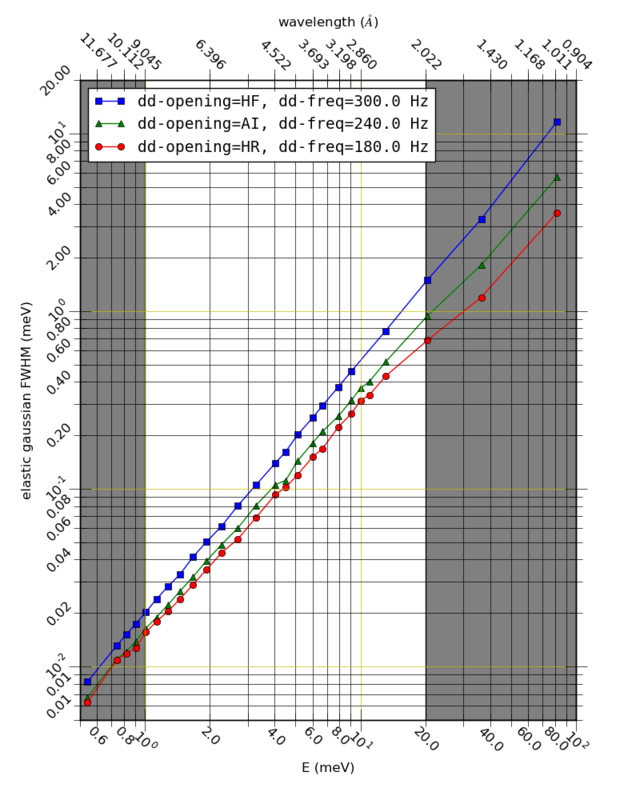 Here, dd-opening is the double-disk opening mode, and dd-freq is the frequency of the double-disk rotation. The gray regions are non-standard incident energies that are non-optimal for the CNCS. Measured in cycle 2018B. CNCS energy resolution for a few popular choices of the instrument setup. The sample is an annular vanadium foil: diameter of 10 mm, height of 63 mm, thickness of 1 mm. 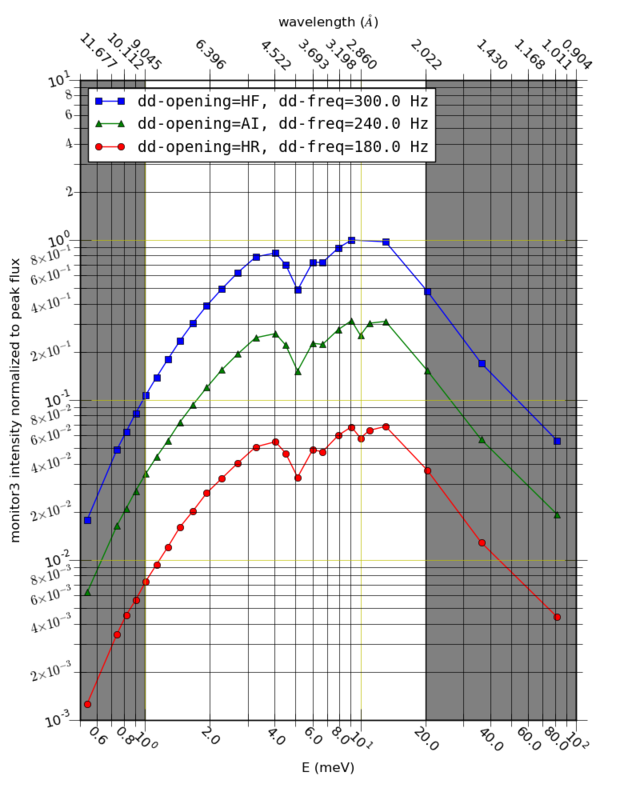 Here, dd-opening is the double-disk opening mode, and dd-freq is the frequency of the double-disk rotation. The gray regions are non-standard incident energies that are non-optimal for the CNCS. Measured in cycle 2018B.